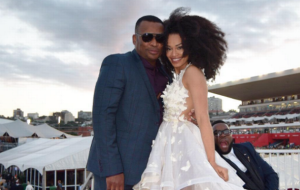 After weeks of swirling rumours and speculation Robert Marawa has confirmed that his romance with Pearl Thusi has ended. The sports personality took to Twitter on Sunday evening to reveal the news to his 583 000 followers on the social media platform. “I confirm the rumour and speculation that our relationship with Miss Pearl Thusi ended a few months ago. We continue to be good friends though (sic),” Robert tweeted. Pearl has remained silent about the break-up. The news comes two weeks after it was reported that their romance had hit a rocky patch. TshisaLIVE reported that its sources revealed that Pearl and Robert were trying to work things out after they went through a series of difficulties. “They love hard and they fight hard. They often have fights and both of them think it’s the end of the road but they manage to find their way back to each other,” said one source. Earlier this year the Daily Sun reported that Pearl’s father was angry that Robert had not paid lobola for Pearl. Bhekizizwe Thusi apparently told the paper that in his family, lobola must be paid before a woman is ‘claimed’ and that he felt “undermined” as her father.